Located in the Highly Desireable lower Residential end of the Quarter in one of five architecturally significant Greek Revival Buildings..Pvt Entrance off spacious front porch with lush front and rear ctyds Furn/Furnishings Included!, Half Bath on 1st flr/Full on 2nd..Lots of Nat Light, High Ceils.,Exposed Brick Walls, W/D on Site, Large bricked Ctyd. Very secure. 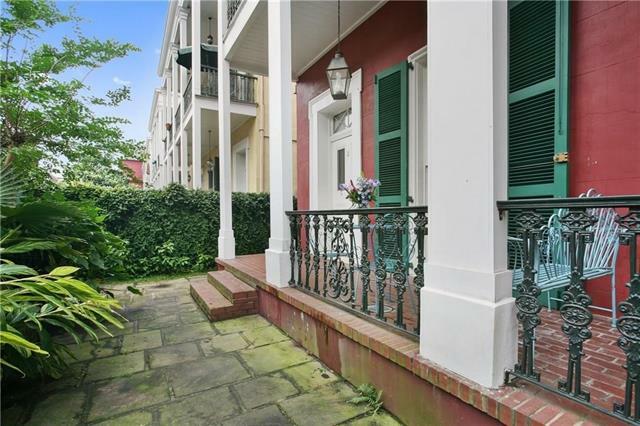 Just steps to the galleries of Royal St and Night Life of Frenchmen.Parking nearby.Hotel in block for guests. Perfect 2nd home in the Quarter!! !